During my dieting years, food was my enemy. We started off as a friendly rivals but slowly transformed into fierce adversaries. We fought for years until I decided that enough was enough. When I finally told myself “To hell with dieting!”, my relationship with food slowly improved. Intuitive eating stresses that giving yourself unconditional permission to eat and legalizing all foods is an important step in making peace with food. When I implemented this concept, it seemed like a whole world of food options had become available to me. What was once forbidden became permissible. It was scary to allow myself to eat without strict rules, but I could sense that freedom from dieting was within reach and this was a crucial step. Having structure in my life makes me feel calmer and more in control. For the most part I know what to expect, and dieting played right into that with its do’s and don’ts. However, those rules led me to restrict certain “naughty” foods. My body’s natural response to this was to crave that food, and I tended to overeat because my body felt such a sense of deprivation. Then I felt guilty because I broke a food rule. It was all bad. To say it was challenging to allow myself the ability to eat all foods would be an understatement. While I knew I was fighting the diet mentality, I also felt like I was chipping away at the structure that made me feel safe. One of my first forays into allowing myself to eat was with donuts. I work at a local high school and there was a serious power outage one winter day. The kids were sent home and the staff gathered in the library to get some direction from the principal. As a consolation for a somewhat cold and semi-dark work environment, donuts and coffee had been purchased for the staff. I had eaten breakfast a few hours earlier, so I wasn’t hungry per se, but I decided to take an old fashioned maple donut anyway. Why? Because I could. I was not dieting, so eating a donut was perfectly fine even if I wasn’t at the ideal number on the intuitive eating hunger scale. I was not bound by any rules. I polished off my oh-so-delicious donut right as the principal finished her talk. There were a few donuts left including another maple donut.1 I paused. Do I really need another donut? No. Do I want one? YES! I decided to eat that donut and I enjoyed every second of it. But does giving myself permission to eat mean that I can just eat and eat and eat? IE is not about mindlessly shoving food into your mouth because it’s there. It’s not entitlement eating. IE is about eating what you want, when you want, while listening to your body’s hunger, fullness, and satiety cues. It’s about body attunement. When I started to implement this, I learned that by mindfully letting myself eat a certain food without judgement, I was able to determine if I really wanted it. And sometimes I didn’t. I butted heads with my dietitian often and one such conflict was about pizza. Pizza is a typical “bad” food since it’s loaded all of those naughty carbs and fat.2 However, it was not a food that I denied myself. I love to cook and make homemade pizza almost every weekend. My pizzas are delicious but much drier than the ones you’d purchase from a pizza joint.3 My dietitian encouraged me to order a pizza from a local restaurant. She kept on insisting, so I agreed to do it pretty much to shut her up. I dreaded it all week. After I paid for the pizza, I walked to the car and placed in on the passenger seat. When I got home, I saw that the oil from the pizza had not only soaked through the cardboard box, but it had gotten on the seat. The idea of consuming that much oil turned my stomach. I realized then that the dread I was feeling all week was because I really didn’t want to eat oil with a side of crust and toppings. If I was going to eat any pizza, it was going to be my pizza, damn it! I came away from this with a caveat to the whole idea of permission to eat. 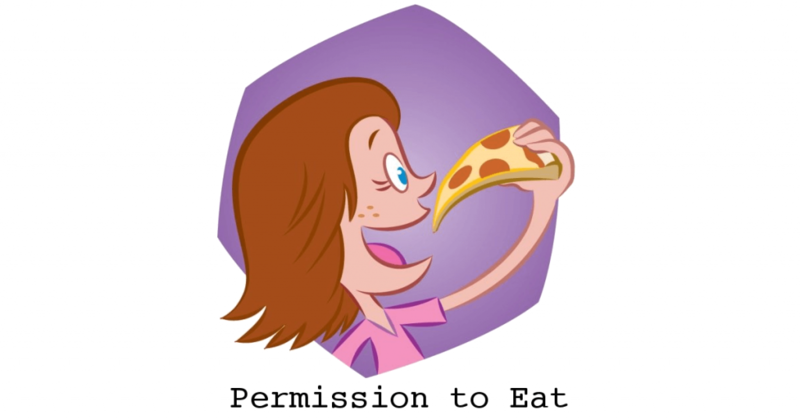 Giving myself permission to eat something is just as powerful as giving myself permission to not eat something. Intuitive eating doesn’t say that I have to eat the pizza. It lets me have the option. Although allowing all foods into my life caused me anxiety, it was a challenge that I’m glad I took on. I slowly allowed forbidden foods into my house and began to remove judgement from what I ate. Food became food rather than “good” or “bad”. I even applied the idea of permission to eat to my vegetarianism. I currently don’t eat meat for ethical reasons, but I have given myself permission to include meat back into my diet if my body begins to crave it. By giving myself permission to eat, I find myself more relaxed around food now. It’s quite liberating! Where are you in the process of giving yourself permission to eat and making peace with food? Please share in the comment section below. 1Can you tell I’m a fan of maple donuts? 2I am being sarcastic. Carbs and fat are not naughty at all. In fact, they’re quite yummy! 3I prefer to not have a pizza-shaped oil spot on my plate when I’m finished. My version may not appeal to all, but my husband and I like it!